A number of commenters are rightfully upset that magicJack is not compatible with Mac OSX (10.11, El Capitan). Earlier versions are apparently okay. If you’re working and you want to register with El Capitan, consider borrowing a friends Windows 7, 8 or Mac OSX prior to El Capitan. If you own an old USB-only device, now is not the time to upgrade your mac if it’s the one you use for your magicJack. If you’re going to use the magicJack Plus, Go or Express with your router most of the time, there is no reason to downgrade back to 10.10 if you prefer El Capitan. If you’re using the magicJack connected directly via your mac laptop and you need the USB connection on the go, you may want to delay upgrading to El Capitan until magicJack updates its drivers for mac. If you almost never unplug your existing magicJack from your router and it’s functioning normally now, there is probably no reason to delay upgrading to El Capitan. Surely, soon, magicJack will have a driver ready for the magicJack series of devices. Carmella: Okay, to clarify Richard , ae you using MAC OSX 10.11 “El Capitan” , correct? Carmella: As of the moment Richard, mgicjack will not work yet in “El Capitan” MAC OS but we are planning to support that in the future. The best thing I can do for you now is to pass your Comment and suggestion to Appropriate Department. Carmella: Would it be okay if I put in your Name in the Comments and Suggestions? Richard Wiker: THat is fine to include my name. Please email me when the fix is made. Carmella: CLICK HERE and fill out the form to submit your enhancement ideas. Is there a rough time frame for mac 10.11 El Capitan future support? As of the writing of this reply, it should be working now with El Capitan. Good luck! why did my latest post get deleted even tho’ i got an email ? All comments are vetted before posting. It cuts down on spam. Guess what – El Capitan is now up to 10.11.4. Per Magicjack support, USB compatibility is only working up to 10.11.2. They are working on a fix. In the meantime, no USB connectivity – which means no dialpad or speaker for me in the interim. I have no phone now when are you fixing this? I don’t work for magicJack. I’m not always successful, but I’ve helped some. Welcome to the world of self-service phone support! When you wrote this, it wasn’t working with El Capitan. Now, it should be. I suggest that everyone working for MJ do without their phones until the incompatibility with el captain is solved. Having no phone for normal use nor emergencies is not fun. The staff should be in the same boat as their customers. Same issue here. Magic Jack plus with El Capitan not working. The Magic Jack Software will not launch, and the system is not recognizing the device. When will this be fixed? According to live chat, it should be working now. Should work now, according to magicJack chat support. We also just upgraded to El Capitan without realizing that we wouldn’t be able to use our magic jack. We use it often and are very disappointed to find out we can’t use it now! We hope you will support El Capitan very soon and would like you to let us know when this will be. Please let us know when magic jack supports El Capitan. We just upgraded to it without realizing we wouldn’t be able to use our magic jack. We are very disappointed! Fortunately I had an unused Magicjack plus sitting in a drawer to replace my nonfunctioning old mj that didn’t work with because of el capitan . I connected that to my router. At the registration site they ask if this is a replacement and I said yes and they replaced MJ and kept my years remaining and phone number on the account. Phone works perfectly from the router. Very happy. The MJplus is a few dollars and I would upgrade to the plus. Will Magic Jack give a refund for El Capitan OS MAC Users? This is total BS. I am done with MJ. I’m sorry your experience was awful. Of course, I don’t work for magicJack, so I can suggest you should try a different device. Your service on this mac update is less than stellar….will probably switch to something that works now….not in the future….give your heads a shake ….filling out another complaint form does nothing for me…….I did it but so what…..get your head out of your A$$ and get this fixed! “Not my circus. Not my monkeys,” as they say. I don’t work for magicJack, so please aim any hostility in the correct direction — not at me. Please add me to the list of those people who want notification that MJ will work with Mac El Capitan. I have my device plugged into a USB port on my computer, not on the router which is at a separate location in the house. Can you please send me an email as soon as you release the new version compatible with El Capitan? I use my MagicJack for business and It will be nice if you team can fix this issues as soon as possible. Sorry — I don’t email people. It should be fixed now. Best of luck. I have upgraded to El Captain and an old magic jack stick it used to work perfectly but now I can not get connection to magic jack any more – can somebody help me? Just updated to mac OS X El Capitan and my magic jack plug will not connect. Pleas notify me by email when you have updated the service system. I’m having an issue as well. Just upgraded to El Captain and now my Magic jack does not work. States can’t find the internet or connect to Magic jack server. Please let me know when this is fixed. This is the only home phone we have. Have kids at the ouse that rely on this phone. Upgrade to El Capitan on my Mac the MagicJack not working need the upgrade when available. 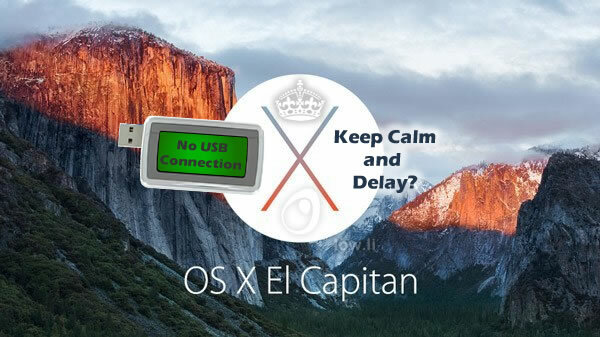 How long do we have to wait for MJ to fix the problem to allow MJ to work on an Apple with the El Capitan OS ? I use the MJ daily and find this problem a great inconvenience. May you please notify me when the relevant El Capitan for MagicJack is released? When will magic jack work on Mac with el capitan OS ? Any Idea when Magic Jack will be updating the driver. Also how will I know when this is completed Thanks for your help. When do you expect to have an installer compatible with osx 10.11? I just purchased the device but can not detect and register the device without software compatible with 10.11. I just upgraded to OS 10.11 El Capitan and am now unable to use my basic “Magic Jack” that I’ve used for over 5 years with earlier OS X versions. I had just renewed my Magic Jack subscription which won’t expire until 2020. I think they ought to fix this soon and provide me with an updated Magic Jack device. They should also have contacted clients like me about this problem so would not have been inconvenience. I’m definitely contacting them on Monday which is tomorrow Nov. 8, 2015 about this. MJ+ won’t work with el Capitan. Period. Personally spent hours trying then spent days and dollars for professional tech. Succeeded in establishing service but lost Internet. MJ+ chat line reps not overly optimistic as to when they can make it compatible with el Capitan. “Soon” is not acceptable. Time to look for an alternative to MJ+. I purchase a Magicjack Express and have been trying to configure. After being assigned a tele number which is 480-###-####, I now find that the magic jack is not compatible with my Apple Computer with operating system 10.11- I am extremely frustrated with this company after having past experience that was satisfactory. What is Magic Jack going to do in compensation for those of us Mac users who prepaid their annual fee … upgraded to El Capitan ….. and now cant use our Magic Jack Plus on aforementioned Mac OS X system ….. Cannot make or receive calls on magicjack plus. Get recording “Error 401 -Check your internet connection or visit MJ.com. Internet connection O.K. Can you assist me? Thanks awfully. Magic Jack walked my through updating MJ to work with EL Captian today. It was a bit confusing, but they did do it. It did involve temporaily stopping privacy settings and then MJ sent my the update pacakge. Waited in text queue for about 6 minutes. Julz: Hi, my name is Julz. How may I help you? Mark Rhodes: I am wondering when mj will be ready for El Capitan Mac OS 10.11. I cannot make the move until mj is ready. Julz: I’m sorry for the inconvenience that you have encountered. Please let me go ahead and assist you. Julz: Do you have the magicjack device with you right now? Mark Rhodes: yes. but that is not the issue. I am running Yosemite now, and want to go to El Capitan, but I cannot use mj with it until your engineers have made it compatible. Julz: Thank you for the information. Julz: We have a fix now for the magicjack device and El Capitan. Mark Rhodes: fabulous. how do I do it? Julz: Are you using the El Capitan now? Julz: Since you are still using Yosemite, we cannot apply the fixes on your Mac for now. Mark Rhodes: ok, so I have to move up to 10.11 and then you can fix it? Julz: Yes, we can try that. Mark Rhodes: This cannot be an experiment because there is no turning back from a Mac OS upgrade. I have to be certain it will work because I need my phone as well. Is this a sure thing? Julz: Yes, it is a sure thing however you will face a multiple trials if the fix won’t work. Julz: I’m sorry to hear that. Julz: I would suggest that you stick on your Yosemite for now until we have the certain fixes for the El Capitan and magicJack. Mark Rhodes: ok, that’s why I asked. I don’t mind waiting a while more, but I have to have no doubt. It is simply impossible to go backwards with Mac OS which is a drag, but it’s the truth. Mark Rhodes: So my original question is when do you foresee an absolute fix? Julz: Thank you for asking from us before making a move. Julz: I’m sorry but we still do not have the exact time frame about that because we do not have the control over it. Please understand. Julz: I’m sorry but we cannot view that link. Julz: I’m sorry for thhe inconvenience. Mark Rhodes: whatever. I think your engineering could stay on top of things a bit better, yes? Julz: Our engineers are doing the best they can to provide a sure fix on the issue. Mark Rhodes: Will there be a post on your site when that happens? Julz: There may be a post about that or you will just be notified through your email or you can chat us back and ask for an update. Mark Rhodes: Thanks for helping not make a big mistake at this time. Julz: You are most welcome. Julz: Is there anything else I may help you with today? Julz: I’m sorry for that. Julz: I hope I somehow able to address your concern. Julz: Have a great day ahead and take care always. Julz: Thank you for chatting with magicJack! Please click the “Disconnect” button and then the “Close” button on this chat window to rate your experience with magicJack Customer Care. can I go back to Yosemite from el capitan? For most of us, it’s a one-way thing. I AM HAVING THE SAME TROUBLE WITH EL CAPITAN AND MJ, I WAS ONLINE FOR OVER AN OUR WITH MJ CUSTOMER SERVICE TRYING VARIOUS SOLUTIONS. NOTHING WORKED. SO UNTIL AN UPDATED DRIVER IS RELEASED I AM STILL UNABLE TO USE THE SERVICE. Does anyone know if that is a legitimate update or a bogus? I think it’s insane that I still have no MJ after several months of incompatibility. The last time I was able to use my device was in the summer. As soon as I upgraded to El Capitan, it became useless. There is no way I am renewing my subscription in January. It should not take this long to address this issue. Agreed. And yet, this has happened. It will be interesting to see what the fallout will be for magicJack as a company. Hi. This problem was apparently fixed 2 months ago according to the people at MJ. You have to download and run the following (http://upgrades.magicjack.com/mjupdate.dmg) but make sure to allow you security settings to “Allow apps downloaded from “Anywhere”” before running this. Rhean: Hi, my name is Rhean. How may I help you? Tom D: I haven’t been able to use my MJ since the summer because OS X El Capitan isn’t supported. When will this be addressed? Rhean: I apologize for the inconvenience that you have encountered. Please bear with me as I help you with this. Rhean: Yes, it was already updated. Tom D: How do I fix this? Whenever I bring up the application it fails. Rhean: Is the magicJack connected into the same computer you are using to chat with me? Rhean: Do you see a dial pad up on the computer screen? Rhean: Please click the link and run the upgrade: http://upgrades.magicjack.com/mjupdate.dmg . Rhean: Let me know once done. Tom D: Thanks. What is magic jack doing for its customers for the months of no service? Rhean: I am sorry to know that. Rhean: Its been 2 months since it was updated. Tom D: How is anyone to know that? Tom D: I didn’t get an email, the application doesn’t direct to a point on the website alerting users. Tom D: How do I speak with someone in management? Rhean: Please stay on hold. Charm: Hi, my name is Charm. How may I help you? Tom D: Hi, are you a manager? Charm: Hi there, my name is Charm. Please give me time to review your previous chats so that we won’t start all over again. Thank you. Tom D: But what does that do for my months of lost service? Tom D: Months that I paid for. Tom D: Well. I am sorry to hear that. I will be finding a new tool going forward come January. And I will also be alerting people about this experience to warn them that MJ takes your money and doesn’t compensate when they are unable to provide the services which were paid for. Charm: Is there anything else I may help you with today? I live in Costa Rica. My Magic Jack won’t work with Capitan. Bad news. I need my telephone. Is there yet any solution? 21 January 2015??? any update ? when will magic jack work with 10.11 ? I just downloaded the El Capitan update on my MacBook Pro/ early 2014 version . It is really buggy, freezing my cursor while plugged in. It is a magicjack plus, 3 years old or so. It saw the MJ a few times and made a few calls to test. It worked then wouldnt work again. Been through it all, restarting, pluggin the MJ in out, livechatt support with ‘senior advisors’. Everything in system preferences , under security and privacy is set correctly. It is simply not done, the programming is not done. It slows the computer noticeably on start up and caused bizarre freezing of cursor, darting around as well. The icon wont appear to click to make calls most of the time. the device is plugged into USB, has been checked by serial number to make sure it is registered. The blue light is on. Their programmers cannot figure it out……..This is a no go, it interferes with my computer in general. Just upgraded to El Capitan, same problem as you all have had – MJ doesn’t work. Spent 3 days on chat’s with MJ, not just hours to try and get it to work. I have the older MJ. I asked the question…..has MJ upgraded their driver to work with El Capitan? Couldn’t get a straight answer, yes or no. Now, I have unused pre purchased long distance minutes and speaking with a live agent in the Philippines, got no satisfaction with regard to a refund. I have asked for a supervisor/manager to call me on my land line with regard to a refund. After spending 3 days of 5 – 6 hours trying to solve the problem of MJ not working, my time is worth a great deal. No, I have not heard from them. Perhaps it’s time to get together, all of us that have paid money in good faith for a service that no longer works,MJ is a company that have not kept up with technology, and is obviously not doing much about their customers satisfaction. Is it time to start a class action suite against the MJ Corporation? We have acted in good faith, paid our money and this is just plain thievery! Sorry you’ve had this experience. Of course, I don’t work for magicJack, so I always say, this device isn’t for everyone. Chat support is all magicJack gives us, so they will not call ever. You could ask someone with a windows machine to help you activate the device, and then use it as an ethernet-only magicJack directly from your router, or you could donate it to someone who has a windows machine. Why would the subject here read “RESOLVED – magicJack now compatible With Mac OSX 10.11 “El Capitan””? I don’t see anything here that points to it being resolved. Most people with El Capitan have been able to use it with magicJack. Hello, I spent 4 hours with MJ support – 5 different agents and none could get MJ Go to work on either of my Mac’s running the latest version of El Captain. Finally the last agent flat out told me their engineers are working on an update, but can’t say when it will be available. I tied the mjupdate fix 50 or more times and finally the update was a success. But unfortunately it still does not work, no dial tone nothing. I did however register plugged into the router. I need the MJ plugged into the computer, as my router is in the living room next to the TV. It really doesn’t need to be plugged into your computer. It can be plugged into your router. Then run a phone line from your router and magicJack to wherever the phone needs to sit. The new OSX Sierra Upgrade broke MagicJack again. The app crashes upon start. I hope this has changed since you posted this. I hope others will chime in if they have a solution. Tried updating the MJ on El Capitan machine. The screen stopped blinking off and on but now the buttons on the MJ screen are not accessible – cannot dial a number, cannot access the menu, etc. Cannot even turn off “Open at Login” to keep it from automatically opening. The MJ seems to be working fine without the software being open because MJ can be shut down using Quit. Icon shows to be no longer active in the dock. Does anyone know where this software lives on the Mac? I cannot find it in Applications. How is it uninstalled? Unfortunately, I don’t own a Mac. Most apps live in the applications folder. It may be disguised as another name, something like vocaltec, which is the parent company of the device maker. I use the magicjack plug in on my MacBook Pro and it ha worked perfectly for almost 10 years. Last night I shut my computer down and restarted this morning. Tried to make a phone call but it would not ring and 2 1/2 hours later it still won’t close. What is going on? I live in Mexico and this is my communication with family in the US. Call magicJack support. It may be that your local STUN settings are messed up. It’s also likely that by the time you’ve seen this, the situation will have been resolved.